Audio-video intercom from Castel has been installed at the €415 million Parc Olympique in Lyon, a sports stadium that hosted matches at UEFA Euro 2016. 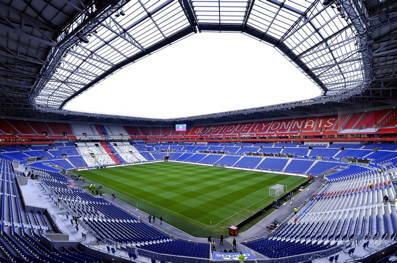 The 59,000-capacity venue in central France is the home ground of Olympique Lyonnais, which plays in the country’s top football division. Parc Olympique Lyonnais boasts the most interconnected information systems for management and spectators in Europe. French telecom company Orange has built a private Wi-Fi network consisting of 500 routers that allow up to 20,000 people to be connected simultaneously. There are 350 IPTV (internet television) screens, enabling spectators to watch replays and view incidents from different angles. The stadium uses ninety audio-video intercom stations from Castel’s CAP IP suite. These full IP/SIP entry stations with Power over Ethernet (PoE) range from single to 10-button units. They feature colour cameras generating high-quality images with H.264 compression. They also benefit from a vandal-resistant 316 stainless steel fascia. The Wi-Fi intercom stations are at entrances, in the car parks, security zones and refuge areas. The breadth of the CAP IP offering meant that the client was able to choose the ideal model for each location in various parts of the stadium, as well as across the overall complex, which includes office space, a leisure centre, museum and restaurants. Where there is a need for constant access by staff and authorised third parties, the stadium uses stations with built-in proximity readers. Access privileges can be adjusted on match days. Castel responded to the need for connectivity by supplying its XELLIP Server Max, a full SIP intercom server to manage simultaneous audio or audio-video SIP calls. Calls and videos can be recorded and retained on a dedicated 1TB hard-drive partition. Ethernet network connection is achieved using 802.1X protocol (RADIUS) and there is integration with Simple Network Management Protocol (SNMP). Castel also enables SIP Intercom integration with Skype for Business. The embedded web server allows monitoring and operation from any browser, but in the Lyon application there is centralised management by Security Center, the unified platform from Genetec. Castel and Genetec recently formed a technical alliance that gives security staff enhanced situational awareness, meaning they are able to identify, process and understand the critical elements of information about what is going on around them. Vital elements of the Castel installation at the stadium are the full IP/SIP master stations. XE Desk-Screen V-P stations are used in central areas, including the security control room. They feature a colour video camera for two-way video communication. This can be invaluable if a visitor calling from an entry station requires assistance in navigating the 50-hectare site or has specific needs. The master stations have 4.3-inch TFT touchscreens with numerical keypads and function keys as well as four programmable keys. The structural engineer for the Parc Olympique is VINCI, which is based in Paris, while the architect is the global practice, Populous, which specialises in sports facilities. Sports fans use a Microsoft app to select their seats, review highlights in play or even order food and drink from digitally connected sales outlets. Lyon is prospering at its new home ground and is currently fourth in Ligue 1. The club has also qualified for the current UEFA Champions League. A technology pioneer, Castel also develops and manufactures all of its own products in full. Castel UK was established in 2010 after the Urmet Group made the strategic acquisition of Castel as part of a deliberate investment plan designed to broaden its product portfolio and increase export sales.